As winter soon approaches, it’s time to store away some of your summer gear, and bike gloves are not an item that can be ignored when putting them away. Besides their intended use, gloves are often used for wiping sweat away and worse as a tissue. That makes the gloves you wear disgusting bacteria collectors if not cleaned, regularly and before storing. So what is the best way to clean them, as a good pair of gloves can be a bit expensive and may not be machine washable? Thankfully, like shorts, jerseys and other articles for bicycling, most bike gloves are made from materials that can be machine washed. By using a little care and then hanging them up to air dry, most gloves can easily be machine cleaned. So, before packing away your summer bike gloves follow these steps for healthy and extended use – whether they are cloth and leather. Step 1 – Close the Velcro or other glove fasteners. Step 2 – Wash the bicycle gloves using cool water and mild liquid soap in a sink. If the gloves are dirty/smelly, add 1/8 cup white vinegar to your wash water. Step 3 – Rinse the gloves well and inspect them for soap suds. Rinse again if necessary. Step 4 – Lay the gloves flat or hang them up to dry. If you can hang them out in the sun, that is even better. Step 1 – Close the Velcro, snap, or button that is on your gloves. Step 2 – Put the gloves in your washing machine, set it on cold water and add laundry detergent. Do not use bleach. You may wash other items with the gloves. If your gloves are particularly smelly, add 1/4 cup of white vinegar to the fabric softener slot of your washing machine. Step 3 – Rinse the bike gloves by hand after the wash if any soap suds remain. Step 4 – Lay the gloves flat or hang to dry. Again, if you can hang them out in the sun, that is even better. 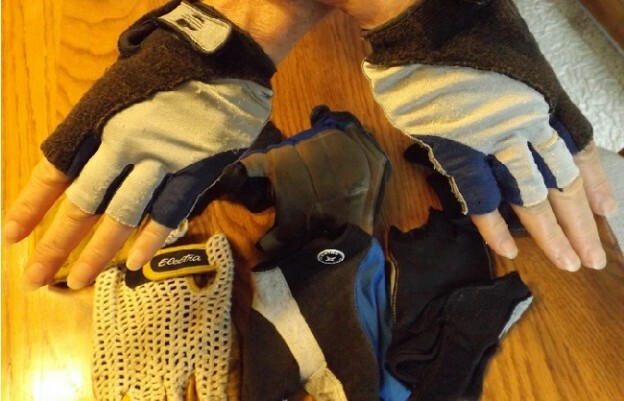 Step 1 – Put on the bicycle gloves. Then, run some cool water over your hands and then apply a very mild soap, such as castile soap or leather soap, into the dirtiest parts of the glove. Step 2 – Rinse the gloves well, spending two to three times as long on the rinsing as you did on washing to make sure all the soap is gone. Do not wring the gloves. Squeeze gently to remove water. Step 3 – Remove the gloves and place them between layers of a bath towel. Press to remove excess water. Step 4 – Put the gloves back on and flex your fingers a few times to mold the gloves back into shape. Then, remove and lay the gloves flat to dry without pressing them again. Step 5 – If desired, massage your cycling gloves with a pea-sized amount of leather conditioner when almost dry – use less conditioner if only part of the glove is leather. In between washing your gloves in the steps above, if they become smelly and damp while on the go, keep a small bottle of white vinegar close by. While wearing the gloves, lightly rub some vinegar into them and let them dry as you ride. Both leather and cloth gloves may be stiff once dry, but they will soften up with a little use. Wash leather gloves as infrequently as possible. If you are a dedicated long-distance rider, they may not last more than one season regardless of how often you clean them. Sommer Adams is a HavefunBiking Contributor. This entry was posted in News and tagged bike glove cleaning, clean bike gloves, cloth bike gloves care, leather bike glove care, sanitary bicycle gloves, tip on cleaning bike gear on October 17, 2018 by Russ Lowthian.